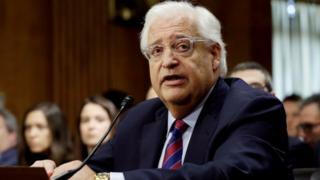 The US Senate has confirmed right-winger David Friedman as America's next ambassador to Israel. Mr Friedman, who was once Donald Trump's bankruptcy lawyer, is critical of the US goal of a two-state solution to the Israeli-Palestinian conflict. He also supports Jewish settlements in the occupied West Bank, and has backed moving the US embassy to Jerusalem. The UN does not recognise Jerusalem as Israel's capital, and the US embassy has been located in Tel Aviv for decades. The Palestinians want East Jerusalem as the capital of their promised future state - but Israel claims the entire city as its undivided capital. During his confirmation hearing in February Mr Friedman, who was nominated by President Trump, apologised to lawmakers for his past harsh language and pledged to be "respectful and measured" if confirmed. The 58-year-old advised Mr Trump on US-Israel issues during the election campaign. J Street, the Washington-based pro-Israel Jewish group, opposed his nomination, saying he "lacks any diplomatic or policy credentials". But America's conservative Jewish organisations backed Mr Friedman. Israeli Prime Minister Benjamin Netanyahu, who did not have warm relations with President Barack Obama, welcomed Mr Friedman's nomination.